Finding the perfect food for your felines isn’t as easy as it could be. Many cheaper dry cat food brands don’t offer proper nutrition for cats. Some of the worst ones will leave your cat with diabetes or another illness when they’re older. You get what you pay for when food for your furry friends is of concern. We don’t mean to scare you. Our only goal is to help you keep your cats healthy and happy. By purchasing the top rated brands, you’ll ensure your cat lives a longer life as healthy as possible. And who wouldn’t want that for the special furball in their life?! 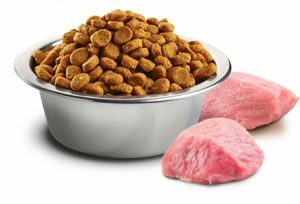 Below you’ll find exactly what makes a dry cat food healthy for your cat and what types of brands to avoid. While there isn’t a ton of agreement on the ideal nutrition for cats, a few things are vital to ensuring healthy felines. We’ve detailed these items, along with our five favorites. 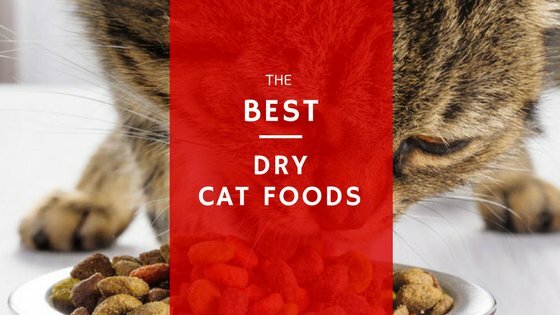 So what should you look for in a dry food? If you’re new to kitty health, then you probably have no idea what to look for in a dry cat food. You see labels hyping all sorts of claims, but finding the perfect food is almost always difficult. We get that. Before I started researching about cat foods, my furry friend was diagnosed with diabetes. The veterinarian claimed that he most likely was suffering from the disease because of the food he ate his whole life and the nutritional content of it. I was devastated. I felt like my cat was suffering because I had fed him the wrong food. So the research began. I dug deep into information about each brand and was able to find out exactly which types of food are healthy for your furry friends and which ones leave them ill. Your cat needs protein. But not just any old amount of protein. Protein must be the macronutrient your furry friend consumes the most of. 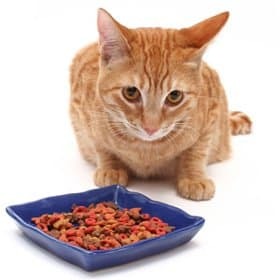 If any dry cat food lists an ingredient other than a high-quality protein source as the first ingredient in the food, then the brand is no go. Do NOT feed it to your cat. Your feline doesn’t need just any old source of protein. NO! The type of protein is essential to the health of any cat. Protein from chicken, chicken meal or even meat meal are said to be perfect for your furry friend. Protein from sources like soy or corn is not good for your cat. You don’t want to purchase a cat food that has by-products in it. By-products can be horrific for your cat. This often means you won’t know what you are feeding your cat. It could be anything. Not to mention – most cats who eat food filled with by-products end up dehydrated over the long haul. Grains aren’t necessarily healthy for your cat. Felines just don’t have that many carbohydrate needs. Ingredients like wheat or white rice can be high in carbs and filled with gluten. That’s not what you want if your furry friend is to stay healthy into old age. No rye. Cats don’t like this ingredient and they can’t digest it very well. While there is certainly no perfect cat food, the above formulas come pretty darn close. As there are some many variables involved in finding one for your felines, we wanted to include a few different options. Things that determine what brand will be ideal for your feline family includes budget, breed, age, health, and a number of other concerns. After extensive testing, we’ve found PETCUREAN Go! Fit+ to be the best dry cat food on the market. When you’re looking for a meat-based formula with zero grains, this is the way to go. Featuring chicken as the primary source of protein, along with a healthy amount of turkey and duck, this formula will fulfill your cat’s protein needs and ensure they don’t get dehydrated from too many carbs. As well, PETCUREAN Go! Fit+ is filled with fresh garden vegetables and human-grade oils that offer essential fatty acids to your furry friends. Certain ingredients like potatoes and tapioca are included in the recipe. While these ingredients are not prominent in the mixture, it’s not ideal to include them at all. 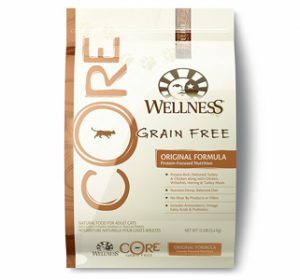 Another one of the top 5 foods available, Wellness CORE Grain-Free Fish & Fowl offers an amazing recipe for kittens and full-grown cats. Pumped full of protein, this brand offers no grains or fillers, which lowers the risk of diabetes and obesity in our furballs. One of the best parts of this formula is the ideal level of phosphorus and calcium. By adding the maximum levels of these ingredients, your felines won’t have issues with growth rates, skin, and other common ailments plaguing cats. Meat is included in all of the five main ingredients, as an essential sign of a great food for felines. The Nutrience Natural Ocean, Fish, & Duck Formula is specially formulated to offer ideal amounts of protein to our furry friends. 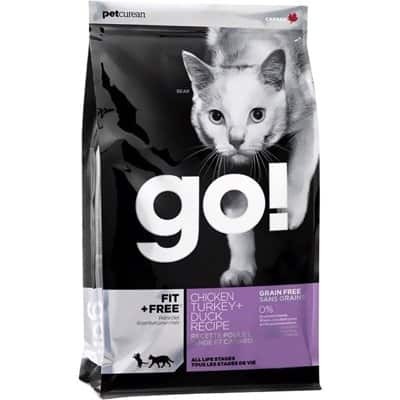 Filled with the perfect balance of duck, fish, fruits, fats, and low-glycemic carbs – this brand does a great job of looking out for your cat’s overall wellness. 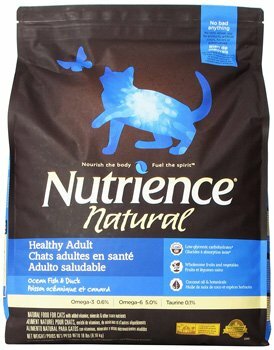 One thing we loved about Nutrience Natural Ocean, Fish, & Duck Formula is how ideal the mix was for kitties with a sensitive stomach. Many cat owners noticed their pet had more energy and was more active after switching to this formula. The brand also follows quality control measures that are equal to human food production standards. 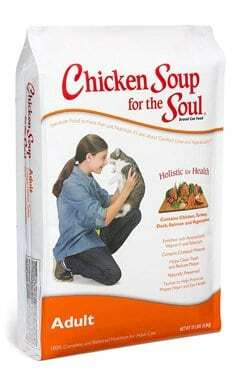 An underrated formula, the Chicken Soup For the Soul Adult Dry Food is sure to satisfy all of your cat’s hunger pangs and nutritional needs. Filled with wholesome ingredients and packed with protein, this brand is meat-based and very reasonably priced when compared to other brands of similar quality. For middle-aged felines looking to stay healthy into old age, Chicken Soup For the Soul may be the ideal formula to test out. Using only the highest quality ingredients, the formula ensures your furry friend’s teeth stay plaque-free and clean. 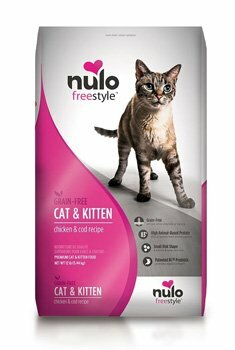 If you’re looking for a formula high in proteins and low in carbs, then Nulo Freestyle Chick & Cod may be just what the vet ordered. A grain-free brand, the formula offers almost 83% animal-based proteins that ensure a flavor your furry friends are bound to love. While there is certainly no perfect option, the above formulas come pretty darn close. As there are some many variables involved in finding the perfect cat food for your felines, we wanted to include a few different options. Things that determine what brand will be ideal for your feline family includes budget, breed, age, health, and a number of other concerns. Overall, you’ll have to test out some brands to see what the best dry kibble for your furry friend is. Just remember to focus on getting high quality protein sources without carbs, and you should be on top of the game. And while you’re at it, check out some feeders that can aid you in the process here. Here’s to healthy cats all around the world!